Challenge yourself with the Salkantay trek. Travel to the Inca site of Llactapata. Explore the incredible Machu Picchu. Witness the stunning historical sight without the hike. Learn the impressive history and meaning behind this majestic location. Be free to explore all corners of this wondrous ancient city. Enjoy a fascinating trekking experience. Check out the stunning beauty of the Rainbow Mountains. Discover the beautiful Peruvian culture. Explore Machu Picchu, one of the Seven Wonders of the World, in one day. Enjoy travelling on a Vistadome train. See beautiful sceneries of the Sacred Valley of the Incas along the way. Travel to the famous Inca ruins of Cusco and its surrounding areas. Enjoy the beauty of the Andean landscape. Visit a sacred hillside Inca site in Pisac. See the beautiful Ollantaytambo town. Tour Machu Picchu with a local guide. Make an express day trip to Machu Picchu by train. Learn about this famous site on a 2-hour guided tour. Travel on the scenic Peru Railway with amazing views. “I went with my partner to Machu Pichu and took the services of Kantu, from the beginning to the end they treated us as if we were the kings of the world, worried about every detail, that all the services are punctual and that we arrived on time at each station, They honestly made us feel very important and we are very grateful, the service and the experience in Machu Picchu, was simply amazing. Capital of the Inca Empire, a visit to Cusco transports you back to the mysterious ways of the ancient culture of Incas and invites you to explore the Sacred Valley and the irresistible Machu Picchu. As you take a tour of Cusco, you will see the Spanish Conquest has left its colonial influence on the city. Despite the historical conflict of Cusco, the city is a welcoming and comfortable base from which to explore the intriguing world of the Incas, and the people who still call Cusco home. La Catedral is a 16th century construction built atop an old Inca palace. It’s a great place to view some Colonial art. Before you head out to Machu Picchu or other sites, visit the Museo Inca to gain some background knowledge on this ancient cosmic culture. The Salinas or salt pans may not sound terribly exciting, but the sight of such an ancient practice brings into focus how much of Cusco still uses Inca traditions to this day. Machu Picchu, the reason many people take a trip to Cusco, is a bucket-list activity like no other. The Inca Trail to Machu Picchu is one of the most famous treks in the world. 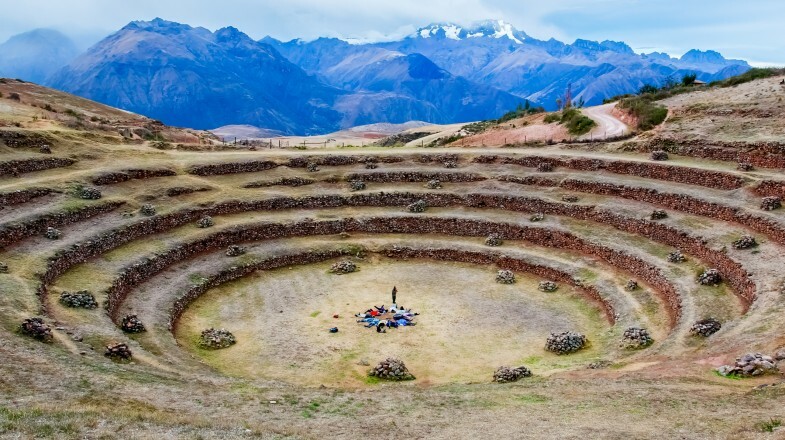 The Moray terraces are an impressive display of Inca wisdom. Each with its own microclimate, it’s believed the terraces were used to experiment with crop growth. Taking a picture with a local dressed in traditional Andean clothing will incur a fee. Coca leaves is a natural way to combat altitude sickness but is not a substitute to medicine such as Diamox. Cusco is very walkable, but go slow while you adjust to the altitude. Like anywhere with a lot of tourists, there is crime in Cusco so take precautions. If you plan to complete the Inca trail, make sure you have any necessary permits well in advance. A Boleto Turistico grants you entrance to 16 attractions for one fee. Rainy season is from December to March, but always pack layers no matter the month. If you’re still hunting for more things to do and places to explore in Peru, do check out our Top 12 things to do in Cusco for more information.